Format Incompatible? Convert It in 3 Steps! Convert your favorite video/music to MP4/MP3 for streaming & sharing between 5KPlayer and Android phone/Smart TV/Xbox, etc. Add files, set MP4/MP3 as output format. 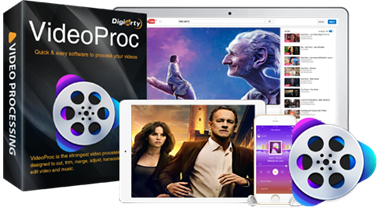 The strongest video processing software designed to convert and edit video music with Full Hardware Acceleration. Level-3 Hardware Acceleration enabled, easily convert DVD, UHD, 1080p, MKV, HEVC, videos to MP4/MP3 without quality loss. 410+ profiles output supported, convert video music for best sharing to Android, Apple, Smart TV, Xbox, PS4, etc. Intuitively download & convert online video music from 300+ sites. Record video from computer's screen or webcam. Customize video quality and size at will. Edit video, merge, trim, crop, expand, add subtitle to make perfect enjoyment. Edit, trim, crop, merge, etc. Freeware favorite HandBrake can handle some video formats, but it's a bit out-of-date, and nowhere near as comprehensive as a utility like WinX HD Video Converter Deluxe. 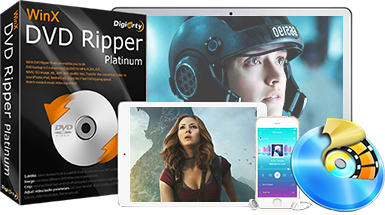 If you have a friend that wants to watch movies on their computer, iPad, smartphone, or any other device, a premium DVD ripper like WinX's offering can be a nice gift. WinX DVD Copy Pro has the ability to copy files directly to a hard drive, a USB flash drive or even video-game consoles like the PlayStation 3. We accept several types of payments , such as Credit Card (Visa, MasterCard, DinersClub, American Express, etc. ), Bank/Wire Transfer, Fax, etc. through 2Checkout. Once you complete the online order via Credit Cards, you will receive your license code by email immediately. If payments are made by bank/wire transfer or check, the orders will be processed after the payment is received. We'll hold the 30-day money back guarantee if our products cannot normally work with error or bug and we cannot solve it within an acceptable period of time or provide a temporary solution. If you have any questions regarding 5KPlayer, please contact support@5kplayer.com. For WinX software, email support@winxdvd.com .